There has been radio silence in federal polls since Feb. 19, when the last federal survey left the field. With the Quebec election in full swing, that is understandable. 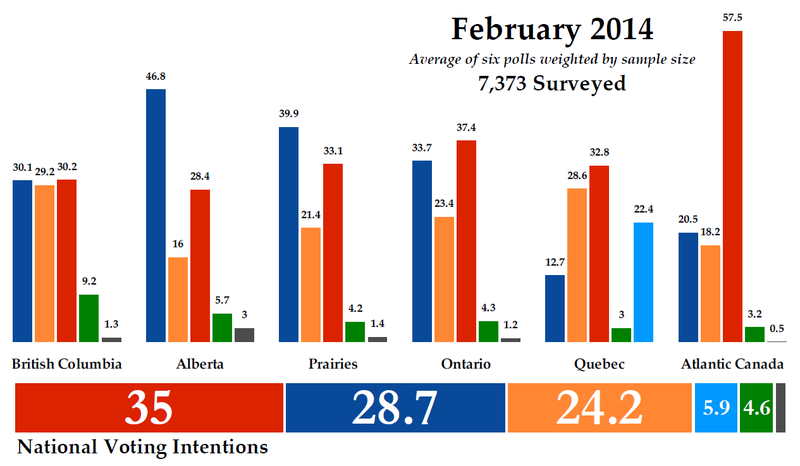 But despite polling being done in only the first two-thirds of the month, February still had six national and regional polls in the field interviewing a little over 7,000 Canadians. The result? Not much has changed since January. The Liberals averaged 35% support in February, down 0.5 points from January. The party has now held a lead in national voting intentions for 11 consecutive months. The Conservatives were up 0.3 points to 28.7%, while the New Democrats were down 0.1 point to 24.2%. The NDP has been very stable, posting an average of 23% or 24% in five consecutive months. The Bloc Québécois was up one point to 5.9% and the Greens were down 0.8 points to 4.6%. Support for other parties stood at 1.6%. Normally I would try to compare apples-to-apples by looking at the last time the firms in the field in February were active. But since one of those firms included Angus-Reid, which had previously reported in January 2013, it is not a worthwhile exercise. Moving west to east, the race continues to be very close in British Columbia. The Liberals dropped 0.2 points to 30.2%, followed by the Conservatives at 30.1% (+1.2) and the NDP at 29.2% (+1.6). Doesn't get much closer than that. The Greens were down 1.4 points to 9.2%, their best result in any region of the country. In Alberta, the Conservatives dropped for the third consecutive month to 46.8%. That represented a drop of 3.8 points since January and the worst result for the party in the province since May 2013. The Liberals were up 0.8 points to 28.4%, the first time the Liberals maintained more than 24% support in two consecutive months since before January 2009 (other spikes tended to be anomalous). The NDP was up 1.5 points to 16%, while the Greens were unchanged at 5.7% support. The Conservatives were up 4.3 points in Saskatchewan and Manitoba to 39.9%, while the Liberals were up 2.9 points to 33.1%. The NDP put up their worst result since May 2013, dropping 6.4 points to 21.4%. The Greens were up one point to 4.2%. The Liberals have been very steady in Ontario, with an average of either 37% or 38% support over the last five months. They were unchanged from January at 37.4% in February. The Conservatives dropped 1.2 points to 33.7%, while the NDP was up 1.8 points to 23.4%. The New Democrats have also been stable at 23% or 24% over the last five months. The Greens were down 0.3 points to 4.3%. I know the monthly average tracking chart can be hard to read at the regional level, so each month I'll highlight one province or region with a magnified version. This month we'll look at Quebec, fittingly enough. You can click on the chart to see a larger version of it. The Liberals continued to lead in the province with 32.8%, but that was a drop of 3.9 points from January. The New Democrats were down 0.2 points to 28.6%, but this marked the first time the NDP held more than 27% support in two consecutive months since before Justin Trudeau became Liberal leader. The Bloc Québécois was up 3.9 points to 22.4% (note that, if we assume every BQ voter also supports the Parti Québécois, Québec Solidaire, or Option Nationale, that leaves some 23% of Quebecers who support a sovereigntist party at the provincial level but a federalist party at the federal level). The Conservatives were up 0.2 points to 12.7%, a level of support they seem to be stuck at - the party has averaged 12% or 13% support for eight consecutive months. The Greens were unchanged at 3%. In Atlantic Canada, the Liberals put up their best result since before January 2009, with a gain of five points to 57.5%. Both the Conservatives and New Democrats have dropped in three consecutive months, with the Tories down 0.6 points since January to 20.5% and the NDP down 3.7 points to 18.2%. The Greens were down 0.2 points to 3.2%. With these levels of support, the Liberals would win 133 seats, a drop of three since the January projection. The Conservatives would win 121 seats (+1) while the New Democrats would take 73 seats (-5). The Bloc would win nine seats, a gain of seven, while the Greens would win two. The Liberals lost seven seats in Quebec since January, but picked up two in Alberta and one apiece in the Prairies and Atlantic Canada. The Conservatives gained five seats in the Prairies, but lost one in both Atlantic Canada and Ontario and two in Alberta. The New Democrats were down six seats in the Prairies, but up one in Ontario. Voting intentions have mostly settled in for the time being. But the election campaign in Quebec, particularly if the Parti Québécois wins a majority government, could shake things up considerably. The results in the pending Ontario election could also have some influence on the federal numbers. It will be interesting to see where things will stand at the end of the spring. Compared to last month, that is -8 seats for the LPC that are going to the BQ, all the other parties are even. Polls smolls. I live in BC and know how in accurate polling is. Plus polls are only accurate if we had fair voting like Pro rep not the antiquated FPTP where most votes do not count. Most votes do count in first past the post and since the threshold to get elected is small they hold more weight. In FPTP your vote is one of thousands in PR your vote is one of millions, hence your vote holds more weight and value under FPTP compared with PR. In PR one does not elect their representative-so the M.P. is accountable to their party not the people-it's great for elites! I don't think I have ever seen as bad a misrepresentation of PR as that, and I have seen some doozies. If the elites like PR so much why do they work so hard to keep FPTP? That's why compensatory-proportionnal is better. Each MP represents a riding, and after that, a few more are added as needed to represent the proportion of votes received. I think that's the best of both worlds. Hahaha. Just because you don't understand my comment doesn't mean it is a misrepresentation. Obviously you know little about PR and how the list system works. The elites are the people who push PR! Gordon Campbell held 2 referenda in BC, Dalton McGuinty held a referendum in Ontario, The governments of Quebec, PEI and NB also held discussions on electoral reform. In every case Jim Rootham, it was an elite not a populist driven process. The people don't want PR time and again they reject the idea. PR is only favoured among a select group of people whose ideas, policies and candidates are continually rejected by the people at the ballot box. .
FPTP does remove most people's votes. It removes every Green Party vote, for one thing. And FPTP makes a complete mess when the top three parties are close to tied -- the winning party is determined largely by the district boundaries, aka gerrymandering. The situation in BC is a complete mess. It's a little better in Canada than in the US, because you have less gerrymandering. In the US, gerrymandering has been used to give control of the legislature to a party with 25% support. Think about that for a minute. PR is the only way to make sure people's votes matter. Compensatory-proportional is fine. Eric, the quality of your commenters has deteriorated greatly. Nah 11 Just a bunch of anti-poll trolls dropped by ! I'm not anti-polls, I believe they're mostly right (even through the major mishaps of the last few provincial elections). I also think they're far from perfect, as the last few elections have shown. I'm stating that here, I believe the sample to be unrepresentative of the actualt population. But then, as was said here before, getting a representative sample nowadays is very difficult with phones leaving the homes and Internet being a free-for-all. Ponderation may help, but if one sample received very few respondants, pondering to those amy not make it moe representative, it may make it more skewed. Anyway, all of this to say, I like polls but I also believe they should be taken with a grain of salt. I live in Alberta (Edmonton) and I have a really hard time seeing 7 seats for the Libs based on current projections. In Edmonton they've got a good chance at one (Edmonton Mcdougall, formerly Edm Centre) but are very weak on the ground otherwise so where do they get the other six? I have spent some time in Calgary and the Liberals have a decent organisation in NorthEast Cowtown and Calgary-Centre. The Tories are probably down 20 points from 2011 and the Grits up 20 so maybe a Lethbridge or Medicine Hat. Isn't there a riding in west Edmonton that often elects Liberals, Meadowlark maybe? Apparently the CPC has started running those stuid attack ads again against Justin. They backfired the last time and this time could really hurt when Justin appears with Hadrien !! Public loves babies and what do the CPC have to compete ? So finally we have the Liberal Platform....... make babies!!! The problem is with the Conservative platfrom: attack not only the man, but also his family. please show an example of attacking Trudeau's family. And I do not mean attacking the policies of his father PET as those are open to political analysis and discussion. I have not seen an attack ad but, I think if a politician uses his family as a prop then they are fair game since, they become public figures. The polls may not have it correct... but they have captured the un-informed voter. Liberals are high in BC... That would have a lot to do with Christy Clark saving us from the NDP. Provincial Liberals are more equivalent to Federal Conservatives than they are to Federal Liberals. They are the right wing choice in the province. If they ask if Christy Clark should be the next Liberal PM and remove the folks agreeing with this the poll would be more accurately represent the vote that will occur when the Federal election occurs. In Alberta the Conservatives are in free-fall.... sort of like Premier Alison Redford.... The shift in vote in a provincial level will go to the more right wing Wild Rose party. Again asking a question of how back Redford is doing as PM and tossing out those sampled would greatly alter the poll and better reflect the Voting intention. The NDP are plummeting in the Prairies. That has more to do with Sellinger being terribly unpopular than The disappointment in Pat Martin and Nikki Ashton. It is hard for the polling firms to get a representative sample and they would have to make thousands more contacts to get informed voters who understand the difference between Federal and provincial politics and understand that the Federal election is 18 months in the future. Bc voice the pollsters are asking who the voter would vote for and then lists the parties. They don't ask leading questions to try to confuse people and skew results. I am just saying that the people responding to the poll are confused and uninformed. They are nominal upset or pleased with their local politicians and are being asked who they would vote for if an election were to be held today. The fact that they may not understands that they are being asked how they would vote in the Federal election that is 18 months in the future. People who do not understand the difference between federal and provincial elections are a lot more unlikely to vote in either..... They do not represent a sample of the universe.... the universe being the people who will vote. "The fact that they may not understands that they are being asked how they would vote in the Federal election that is 18 months in the future". Pollsters do not ask how you will vote in 18 months. Respondents are asked how they would vote today regardless of when the next election will occur. They are not being asked: "What party will you vote for in the next federal election"? They are asked: "If an election were held today what party would you vote for"? The Federal election is not due to take place for 18 months, Which political Party would you vote if the election were held today. No prompting with Party names. After the answer is given a follow-up question. Who is currently the leader of the Party you have indicated you would vote? Wrong answer and not in the survey. It would be somewhat more costly as a lot would get thrown away. But it would more closely indicate what would happen in an election. It would also be interesting to see the low level of political awareness and involvement we have in Canada. I really think these amendments are not rational. Uneducated people vote, if pollsters want to have the potential to create accurate samples those people need to be included. You can not ask how would you vote today for an election in 18 months, the question does not make sense! A rational person very likely may not know the answer since, they understand their choice may change due to various factors including the passage of time! bede completely agree with that set of points. Even six months is a bit of a stretch but more plausible. "Tapping into the Pulse" is out! What if the Orange Wave crested earlier? Everything we thought we knew was wrong?